Product information "HOPE easy-set threading jig with hinge plate"
The jig comes with 16 tpi spindle pitch and 1" stem as standard. 16 mm, 19 mm, and 30 mm are also available on request when ordering. Just add a note in the comment section upon checkout. Its called the easy-set threading jig because the depth cut is done by twisting the outer (silver round handle) clockwise to push the main body into the cut. The handle has an internal click system so 9 twist clicks gives you the depth for the 12 tpi , 7 twist clicks gives you the depth for the 14 tpi, 5 twist clicks gives you the depth for the 16 tpi and 3 twist clicks give to the depth for the 20 tpi. The handle on the back gives a 6" swing so you can rotate under control easily. The 20, 16 ,14 and 12 tpi parts are machined with the front thread out of one piece. 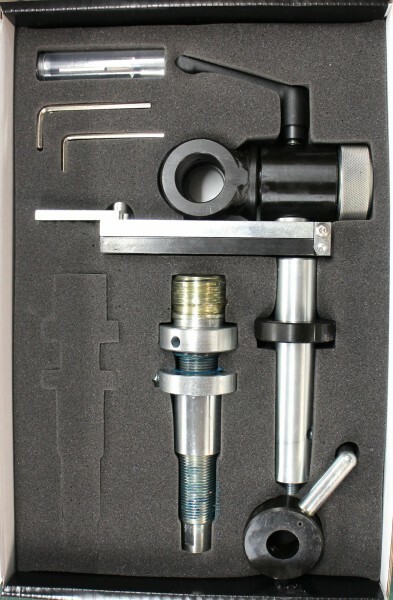 This gives ultimate accuracy unlike systems where the thread adapters have to be attached to a common holder . Related links to "HOPE easy-set threading jig with hinge plate"
Customer evaluation for "HOPE easy-set threading jig with hinge plate"